Let Zeus be your ally on Zeus God of Thunder slots. Featuring a RTP of 96.1%, this game can give you some thundering big wins. 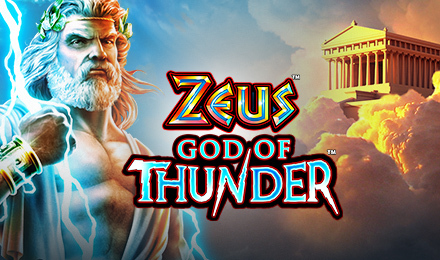 Spin the reels of Zeus God of Thunder slots at Moon Games, and dive into ancient Greece. This well-crafted game has been designed by Scientific Games, and consists of 5 reels and 30 paylines. Free Spins Feature, Extra Bet, Wheel Play and Jackpots are the amazing features you will find on this Greek themed slot game. Pay a visit to Zeus anytime, and he might send you some thunder-wins! Plus, these outstanding features will surely help boost up your winnings. Catch up to 100 free spins on this slot game.